This month for Virtual Book Club for Kids we are featuring books by Bill Martin Jr.! Our favorite Bill Martin Jr. book is Chicka Chicka Boom Boom. 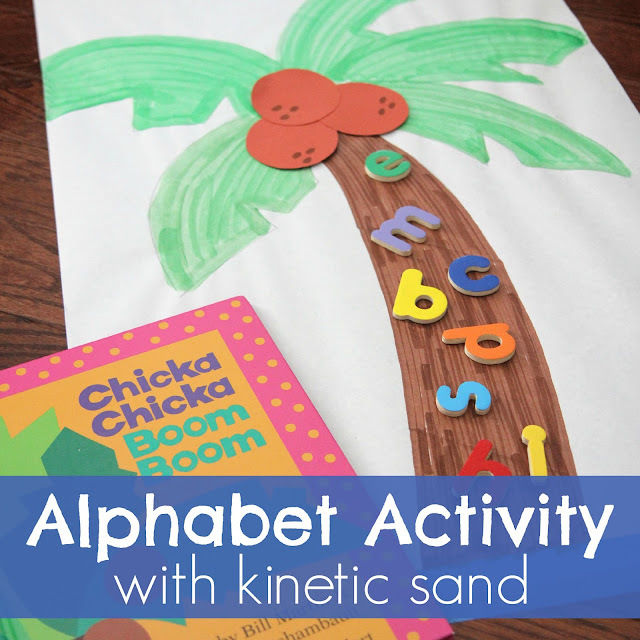 For our activity this month we got out some kinetic sand and created a simple Chicka Chicka Boom Boom themed alphabet activity that was so much fun! 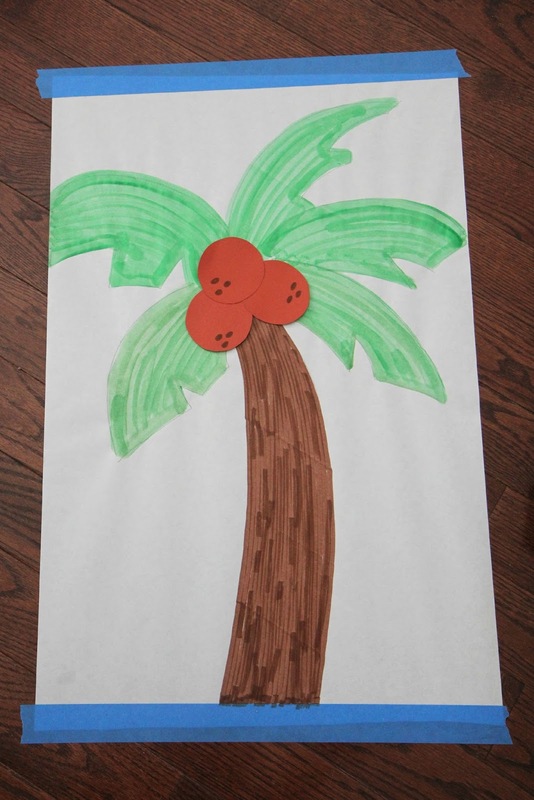 Before we started our activity we read Chicka Chicka Boom Boom and then we made our own big coconut tree using some paper and Do-A-Dot markers! We also got a small container and buried some alphabet magnet letters in kinetic sand. To get started with our alphabet activity I gave my kids little tweezers and they used them to search in the kinetic sand for alphabet letters. As my kids found the alphabet letters they added them to the coconut tree. Using the tweezers was such a great way to strengthen little finger muscles and build hand-eye coordination. All three of my kiddos (ages 7,4,2) had fun doing this activity together. Two of them would bury the letters while the other one closed his eyes. Then one would find all the letters and together they'd put them all over the coconut tree and talk about the letter names and sounds. It was adorable to watch how well they worked together and had so much fun with this activity! With my 2-year-old we just talked about the letter names while we explored the letters. With my 4-year-old we talked about the letter names and their sounds... and with my 7-year-old we talked about words that started with each letter and he even built a few words with the letters. 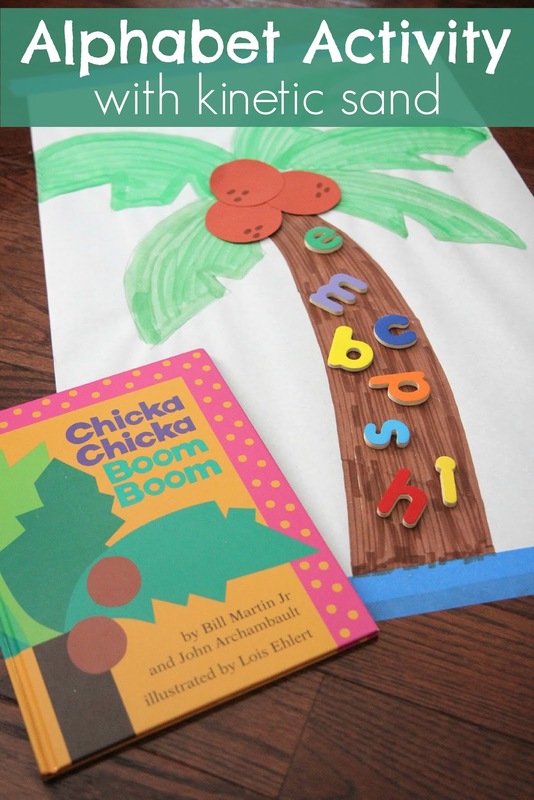 One of our other favorite Chicka Chicka Boom Boom activities includes a Name Craft! We LOVE Kinetic Sand! This is the perfect activity for it! Kinetic sand is so much fun. It is such a neat sensory experience! I love how well this activity works for different ages.